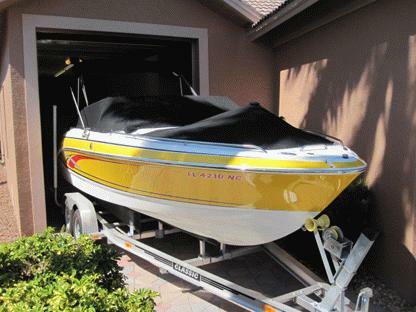 This 2006, FORMULA 240 BR is a perfect example of an extremely well maintained boat. She has been garage stored in the summer and lift stored in the winters. This purchase price includes a 2006, CLASSIC Dual Axel Trailer, also in excellent condition. The aft seat folds into a tanning bed and to adjust the stereo system, you need not get up, just reach over to the additional aft mounted stereo controls. Lift under the port aft seat to reach the cooler and before you know it you're having a fantastic weekend! Walking forward of the large aft seating area, there is a removable table that securely stows away in the starboard side of the engine compartment. The electric engine hatch makes accessing your engine room a breeze. Forward to port is a privacy head with a Jabsco Head system with holding tank. Opposite the head is large locking storage area with AM/FM/CD stereo access. Moving forward, the walk-through windshield makes it easy for you and your guest to access the bow seating areas. When Island Hopping, the forward removable bow ladder makes it extremely easy to board and disembark the vessel. 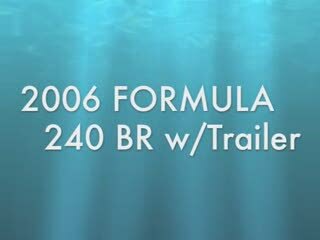 Before you buy new, this is a FORMULA that you definitely want to take a look at in person! EXTERIOR: Imron Graphics w/cockpit accent striping; Pressure-treated Perma Penal structural hull matrix; foam-filled hull cavities; Chemically bonded & thru-bolted deck-to-hull joint; Heavy-duty PVC gunwale w/stainless steel insert; Concealed fiberglass anchor locker w/316L stainless steel beach ladder; Stainless steel hardware & 316L stainless steel welded rails; Stainless steel fuel fill w/intergral vent; Tinted, tempered curved-glass windshield w/center walk-thru; Windshield wiper; polished air horn; 316L stainless steel transom grab rails and ski/wakeboard swivel-head rope mount; Transom-mounted stereo remote control; Transom-mounted outdrive switches; Extended intergrated swim platform w/consealed 316L stainless steel swim ladder & pull-up cleats and Portside transom trunk storage. COCKPIT: Continuous molded cockpit liner; Dash panels w/burl wood finish & brushed metallic finish; Complete Livorsi® illuminated instrumentation, domed w/chrome bezels; Garmin GPS map 172C; Standard Horizon Gust VHF Radio w/distress and fold-down antenna; Dash panel-mounted Ritchie Compass; Digital Depth Sounder; Side-Mount shift/throttle control w/trim switch; Safety ignition stop switch w/tether; Dino tilt steering wheel w/burl & brushed metallic accents; Bennett ® trim tab switches & indicators; Auxiliary 12V outlet; Illuminated waterproof accessory rocker switches w/E-T-A circuit breakers; Kenwood AM/FM/CD Satellite stereo system w/high-power output dash-mounted full feature remote control; four (4) 150W 6 1/2" marine-grade speakers w/polished stainless steel grilles & separate tweeters; Thirteen (13) polished stainless steel drink holders; Cockpit/swim platform blue/white LED courtesy lights; Weather-resistant cockpit seating featuring Pre-Fixx® coating. Dual-position twin bucket seating; L-shaped aft lounge seating w/igloo cooler below; Aft-facing sun lounge-converts to full length sunpad; Removable cockpit table; Molded wetbar w/stainless steel sink, Corian countertop, concealed trash container, fire extinguisher and 316L stainless steel safety rail; Demand water system; Battery on/off switch; In-floor ski & waterboard storage; Bow and cockpit black Sunbrella non-fading covers (new in 2009). HEAD COMPARTMENT: Continuous molded liner; Curved one-piece locking door; Portable head unit; Carbon monoxide detector. ENGINE ROOM: Single Gas Fresh Water Cooled MerCruiser 350CI, 320HP MPI Horizon Stern Drive (95 hours); Motorized hatch lift; Courtesy lighting; Fume detector; Automatic fire extinguisher; Thru-bolted engine mounts; Remote oil filler; Two (2) New Deka Marine batteries w/retainers; Active & passive galvanic corrosion protection systems; Bilge blowers; Automatic bilge pump; Bravo Three Outdrive w/counter rotating stainless steel props. BROKER'S COMMENTS: Showings by appointment only. Contact Jerry Chiappetta, Jr. at 239-430-2628. Make Offer - Ready to go! FOR SALE - Call Today! Lift Stored & Well Maintained! Don't Miss Out! Make Offer! 0 Boat Product or Service Ads!